While I’m a big fan of Star Wars, I’ve never really amassed much of a collection of the LEGO sets. I’m not really sure why – maybe it’s because there are so many other excellent sets that I’d rather buy. 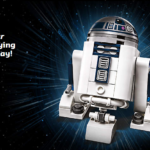 I was browsing the net a while back and came across a post by a fellow Aussie blogger (The Rambling Brick) about one of the Star Wars buildable figures. 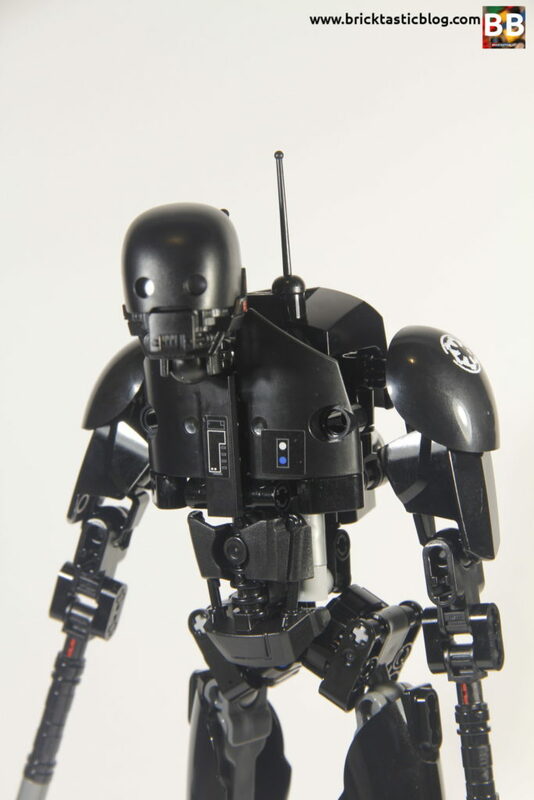 K-2SO. The enforcer droid from Rogue One was easily my favourite character in the film, and was voiced by one of my favourite actors, Alan Tudyk, so this set caught my eye. I saved up some coin, waited until I was ready to do a big order, and grabbed one. It came in the other day, and I was so excited to get stuck into it, I opened it the next night. This was the first constraction figure (constructable action) that I’ve ever bought. 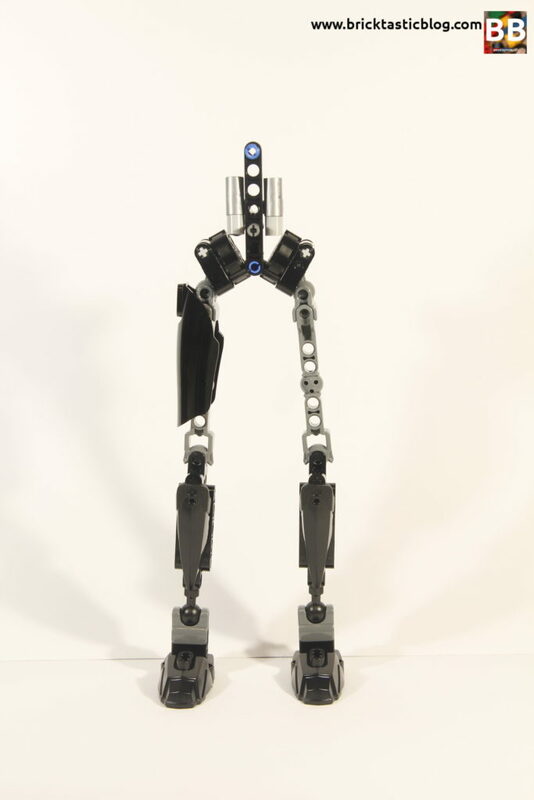 I’d seen my mates’ Bionicle collections, but that was as close as I had gone to having one. Until now that is! I was quite surprised by what I found. Inside the box were four un-numbered bags – each had different sized elements in them. Small, medium and large parts, with the head in a separate bag. There’s also the important instruction booklet, and a small sticker sheet with two stickers. There are a few new elements included in this model, which is no great surprise. All of the larger body parts aside from the shin coverings are brand new moulds. There’s of course a lot of black, with grey thrown in for good measure. The set is comprised of typical inclusions for Technic, however there were a couple of surprises for me – some corrugated pipe, and a black version of a minifigure foil (the sword seen with CMF Series 12’s Swashbuckler). It makes for a great antenna. The constraction elements are also interesting. Larger sections have balls in the middle of the elements, as well as on the ends. I’d never come across these before, so it was a learning experience! I’m not sure how well they will translate to other uses, so I’ll leave that for the much more creative fans. If you have any ideas, please let me know! 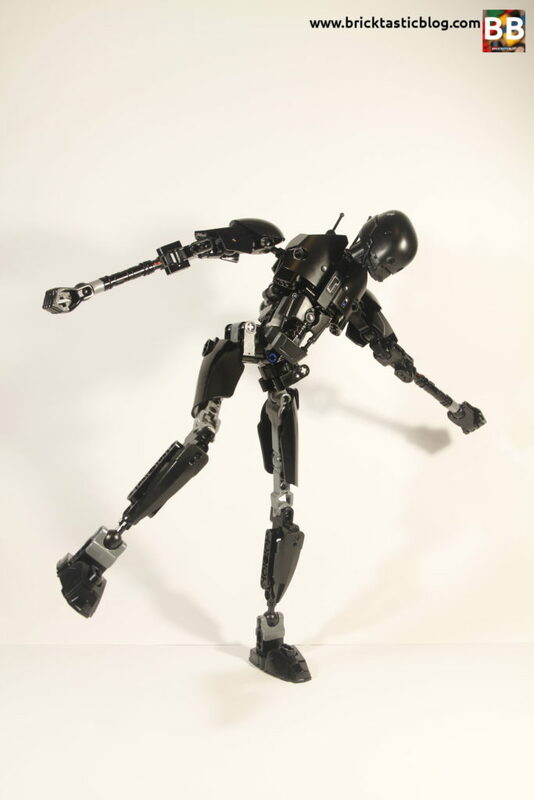 I’m incredibly impressed with K-2SO’s range of motion. Every joint has movement, and while there are limitations to some of his movements, they are still vast. He has limitations in his arms – his forearms are very long, so fine movements are harder to accomplish. His legs are also limited by the movement in his hips. There isn’t a great deal of rotation, so when the legs are pushed to a sitting position, I found that his knees point out, so he either has to sit spread-eagled, or lean right back. He looks quite relaxed when he does lean right back though! I’m also amazed that he is able to balance one foot quite successfully. Seriously, this figure is great. The tiny things that are a problem with it don’t really rate when compared with the movement he has. There’s also the punching mechanism, but I’ll get on to that in a minute. This is a quick build. It’s over in about 20 minutes if you take your time, which is great, because the rest of the time you’re testing out movements. Start at the feet and work your way up. The interesting sections are all in the torso. The most interesting section is without a doubt the punching mechanism. 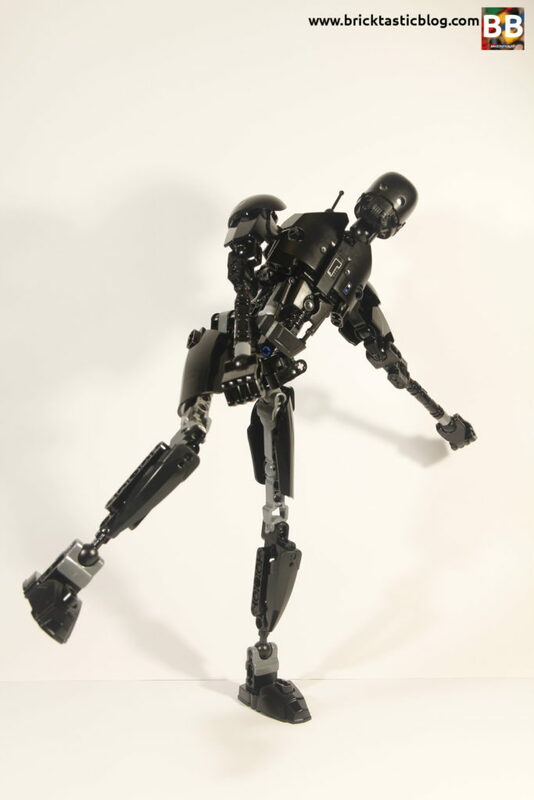 There’s some simple Technic trickery involved, and I wasn’t sure what I was building until the last step, but you can rock the grey slide shoe side to side, and K-2SO’s arms move forward in a punching motion. It’s very clever. After the armour has been added, simply add the antennas and the head, and you’re done. It’s quick and rather easy, but there are still some clever techniques used, if you’ve never seen a constraction figure before. 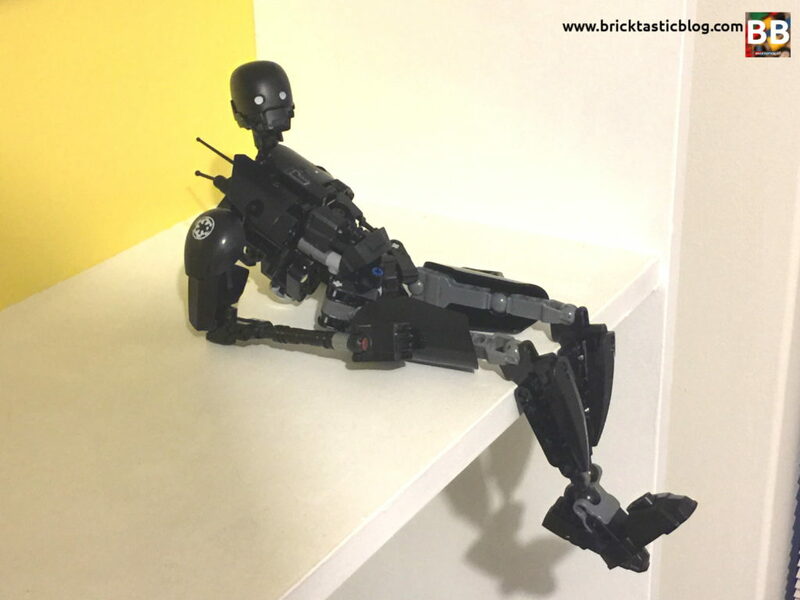 K-2SO is quite sleek and finished. 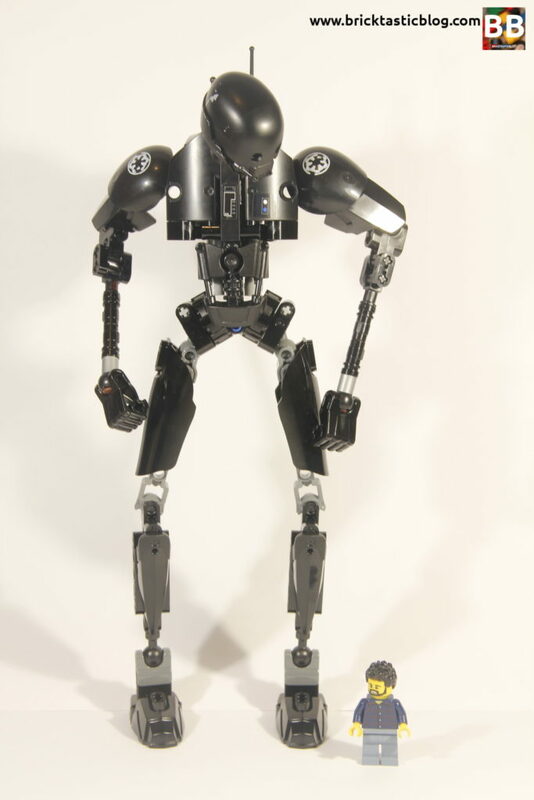 There are a good amount of panels on his torso to cover up his innards, and there doesn’t seem to be any missing sections – sometimes these constraction figures can be too robotic – good thing K2 is a robot! I am particularly impressed with his head. It comes as one bagged piece, and even has the little details like scuff marks and scratches. It’s an impressive amount of detail. 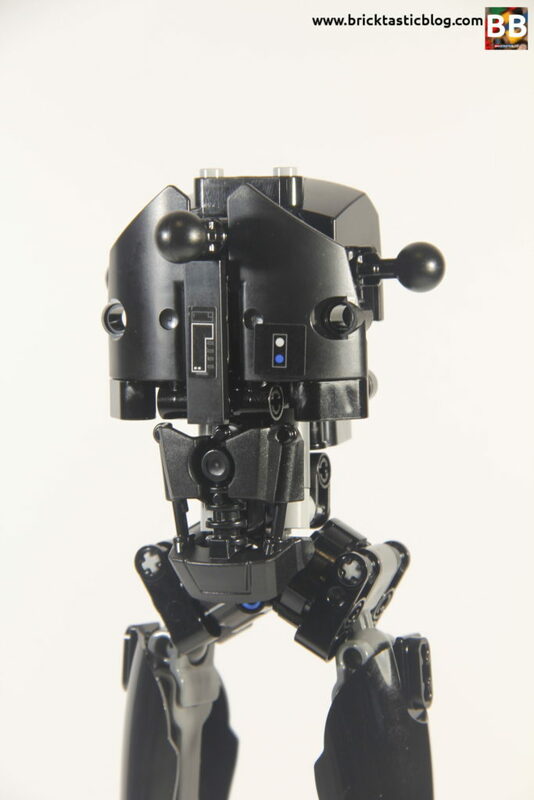 He is also quite expressive for a robot, with the movements he can make. He of course doesn’t have facial expressions, but there is an element of it present. He’s strong, too. The model can take a few knocks. What I was the most surprised about was the sheer size. It’s a much taller set than I originally thought – at least twice as tall! he stands close to 30cm tall, and you realise this as soon as the box is opened. The parts are quite large. Value for money is sometimes tricky, and especially so for this case. Often, the price per element is quite arbitrary, as elements themselves are different, and have different values for different people. This one sits at around the 20c mark, and there are some inclusions that will be quite useful, and others that are single use only. 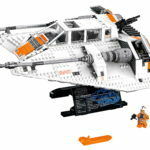 It’s a set on the cheaper end of the scale, at $40, and is a quick build. I think it’s got some good value, especially as he can be repositioned, however this is offset by the elements included. Not counting the Bionicles, there are still a decent number of constraction figures around – almost 50 since 2012, with some interesting inclusions such as Batman, Hulk, a heavily armoured Captain America, a few Chima varieties, and plenty of Star Wars ones. If you were to collect all of them, it would be quite a display. So far, however, there’s only been two robots, both from Star Wars. 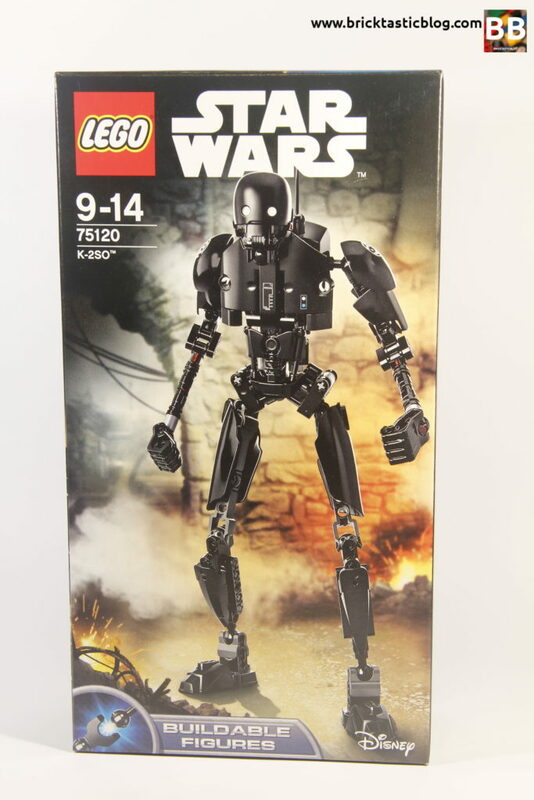 K-2SO, and 75112: General Grievous. Constraction figures are very much a niche market. They won’t be for everyone, but that’s ok. I’m glad I’ve got one, because I’m having endless fun positioning him around the house! Next week, I’ll be delving into a new theme for LEGO, the BrickHeadz! Particularly the DC Comics ones – Batman, Robin, The Joker, and Batgirl. Do you have one of the recent Star Wars constraction figures? What do you think of them?